I get such a sinking feeling when I’m a little bit late to the bus stop and the bus is a little bit early. I’ll see it pulling away when I’m just close enough to not be able to do anything. Maybe if I carried one of those air horns. Ya. Been there, done that. Bahahaha. I guess that’s what happens when you’re on fire – all that is left, if anything, is invisible. My sister once has a bus that came late, and since she had to catch two buses in a row and the second bus came on time, she missed the second one. It took her an extra hour to get to where she was going. It’s super powers week! I hope you do an eye beams joke. That’s basically public transport in my city. Leave an hour early to get there an hour late, and don’t expect any buses to ever show up on time. Needless to say, I got my licence as soon as I could and gave up on it altogether. So… Is this gonna also be like one of those old Beneton Ads. You know… The United Colors of Biff week. its allways the same. the only time the bus comes on time is when you’re not. First fire, now invisibility. What’s next, stretchiness? I know the ‘invisible’ feeling: try to catch a taxi in NYC on a really cold day… Busses, though, are easier. All you need is a harpoon and rollerskates. I have the opposite problem. I’m such a part of the background people always assume I’m there. I’ve had people ask me about homework assignments when I wasn’t in their class (or grade! ), I’ve missed a lot of parties because people thought they already invited me (and apparently I had a good time!). In this case, the bus driver would check his mirror to see just who it was he picked up six stops ago that he SWORE was me! This is me, standing in front of a motion-activated door. I bet Friday is going to be Dr. Doom. At least he hadn’t replaced all his locks with biometric readers (finger print readers, retinal scanners, etc.) the night before. I can certainly see (or lack thereof) why he doesn’t just take his invisible green car. Where I live, our public transportation system is kind of mediocre, but only because too many bad choices were taken at the same time!, the point is, lots of people don’t pay their rides, and the system keeps loosing and loosing money, on top of it, bus drivers are underpayed and overall pissed off, it’s very likely for them to skip your stop if they see that fit, I once saw how five buses just went past my stop, were me and like seven more people were waiting and gesturely begging the drivers to stop. Bus pulling away,n I’ve got a cool true story for that. So it was the last bus of the night, and I had to transfer from one bus that was late to the other that was early, I could see that the bus had already pulled past the stop but traffic was thick enough that it was only a few car lengths past. So I began running to the bus like my life depended on it. I was about 40 feet away when traffic started moving, and I tripped and started falling to my knees. Before landing I blacked out, but when I came around I was running again, and thoroughly confused. The bus driver had pulled over for me and had this dumbfounded look on his face. I asked him what happened and he explained that when I tripped and fell to my knees I somehow did a front flip from my knees and landed on my feet running. So this leads me to believe I might have an alter ego… one that’s apparently a free runner or an acrobat. Having worked in transit, I can tell you we do it all for spite. Low wages, (except for that ‘other’ system we can’t get a job at because we’re not related to anyone already working there), Lousy or more often NO benefits (except that ‘other’ system), crazy and rude people who seem to think we can drive in between rush hour traffic snarls, no future to speak of except to become some delusional manager who thinks the ‘Employee of the Month’ plaque means something (especially when you get NOTHING with it, and you don’t even get to keep the plaque), no future to speak of. And not to mention that transit driver is one of the top ten most stressful jobs you can have. Yeah, most of us are pretty bitter. Except those jerks at the ‘other’ system who have good wages, benefits, unions, and managers with at least a 40 IQ. Oh, and last year they took away the coffee machines. So now the drivers are all grumpy AND sleepy. @Baughbe Also, no future to speak of. I usually have pretty good results catching buses. This does mean that I frequently resort to tearing down the street after the bus, often for a stop or two before catching it or giving up — or better, if there’s a turn nearby, I’ll cut it off if possible. But if I’m 50 feet from the bus and it’s about to pull away, I yell. My dad was in the Marines, so to get a word in edgewise during arguments, I learned to yell like a Marine. So the bus usually stops. This is quite useful when I’m on my bike, too — it’s like having a horn, only louder and evokes a more visceral reaction. I remember once, after a friend had visited, I was following him to the busstop. The rain was pouring down all the while, and as the bus drove past us I noticed the driver looking the other way. 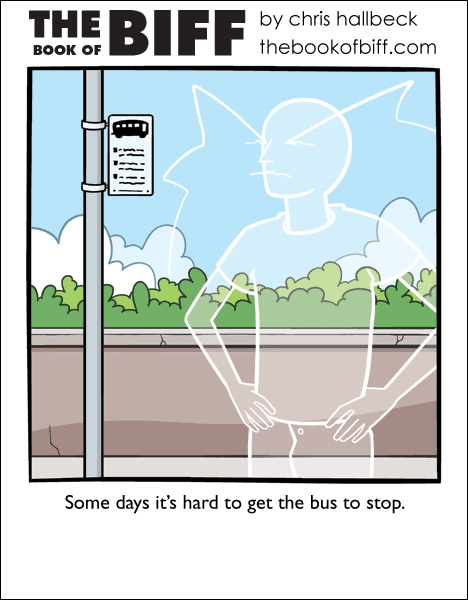 Why would he be looking away when he knew there was a busstop there? Im not sure if this was late enough that the next bus came a whole hour later, or if it was just 30 minutes…but it was no fun anyway.